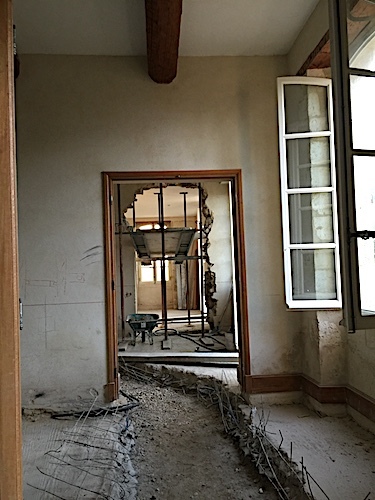 Last year I completed a 2-year interior design project just outside of Avignon, France called Le Mas des Poiriers. The translation is “the house of Pears” because its sits on 65 acres surrounded by Pear trees. 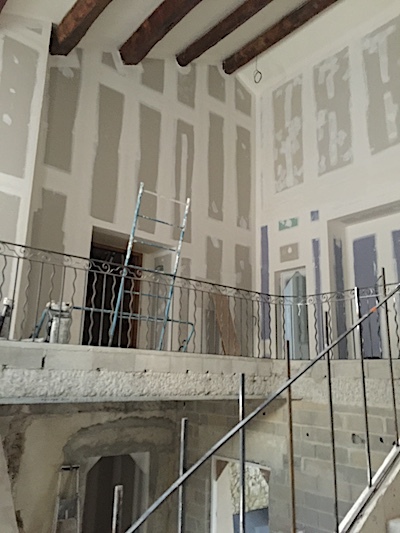 This post is one of 4 discussing the restoration and decoration of this project and the team of professionals that collaborated together to make it a success. 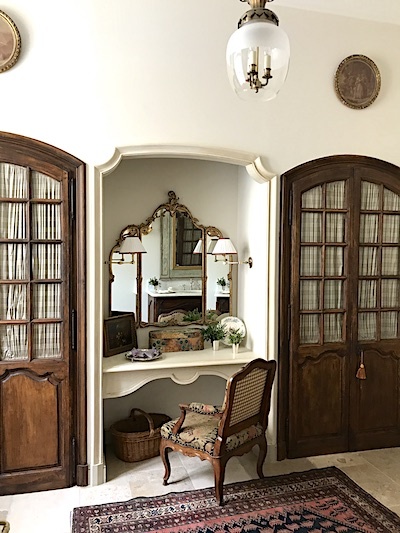 My long-time US client from Connecticut loved Provence and it was a dream of hers to purchase and restore a property there. 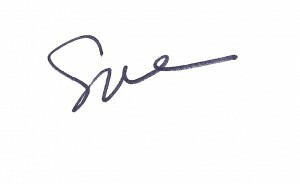 She and her husband purchased an 18th Century mas (Provençal farmhouse) and entrusted S.B. 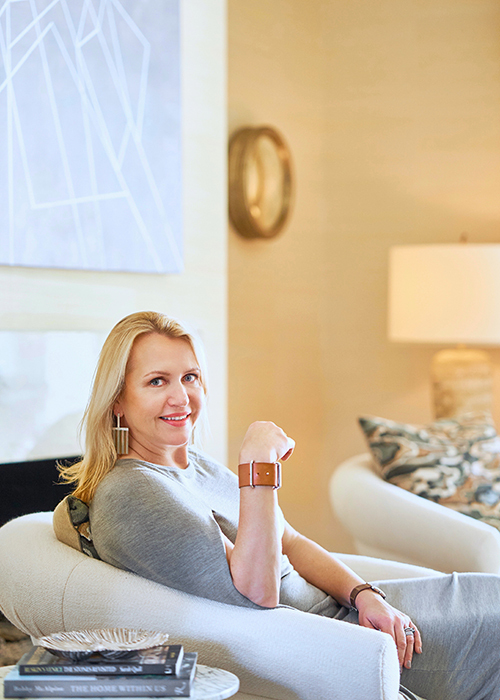 Long Interiors and Restoration Specialist, Alexandre Lafourcade of Lafourcade Architecture and to work collaboratively with her on its renovation and interior decoration. 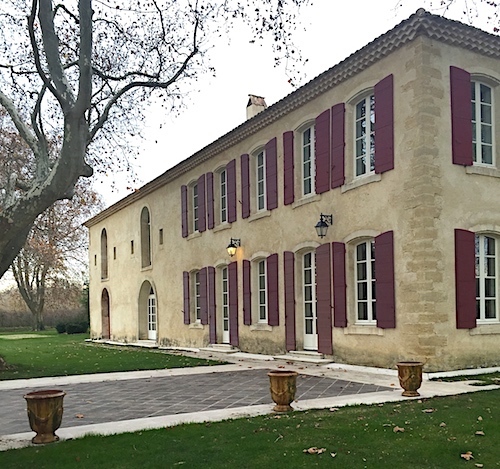 Alexandre is well known in France for his thoughtful restoration of elegant old Provence properties. 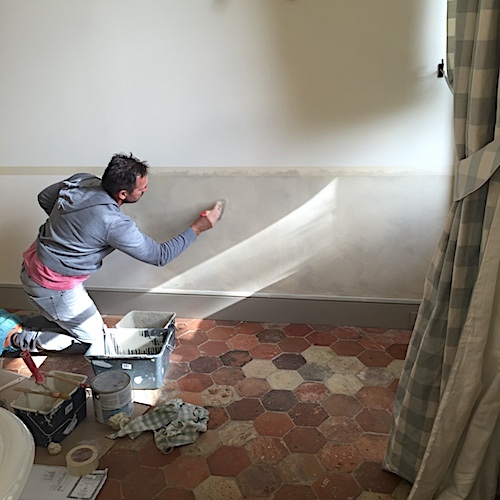 Having a love of old classical homes, I was thrilled to work with my client again, and with Alexandre, to restore and elevate the style of this existing mas. It was also wonderful to observe celebrated landscape designer, Dominique Lafourcade re-imagine the exterior gardens. Though the house was previously occupied, the interior layout was disjointed and the rooms were dated. My client had a defined vision for the house and wanted to expand the interior footprint and incorporate the attached livestock barn areas (shown on the far left of the top photo above) within the new interior. 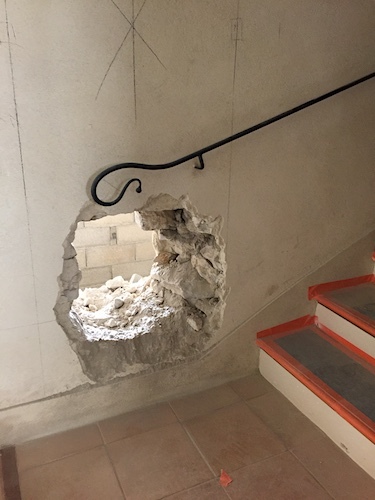 With this extra space, Lafourcade proposed changing the location of the entry and reversing the existing stairway to improve the flow of the house. 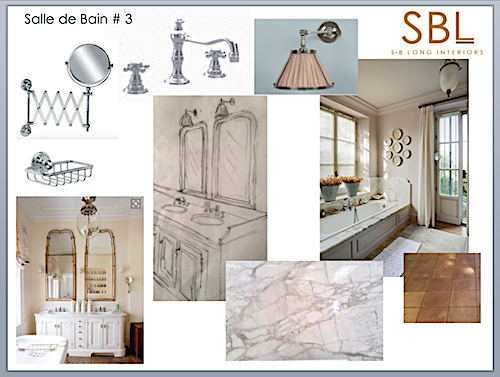 Working together on the interior layouts, we finalized a plan that combined the best of a grand French interior and one that also functioned for a large US family. For example, LaFourcade designed lovely sight lines through multiple double doors running the length of the house. The development of those doors is shown above. I suggested squeezing in familiar American elements like an informal powder bath on the back stair landing for easy access from the Kitchen and Family Room. The photo above shows us breaking through the wall and the beginnings of the bath. Watching the French construction teams at work was fascinating. The thick stone walls were knocked away and carefully rebuilt amongst metal supports. 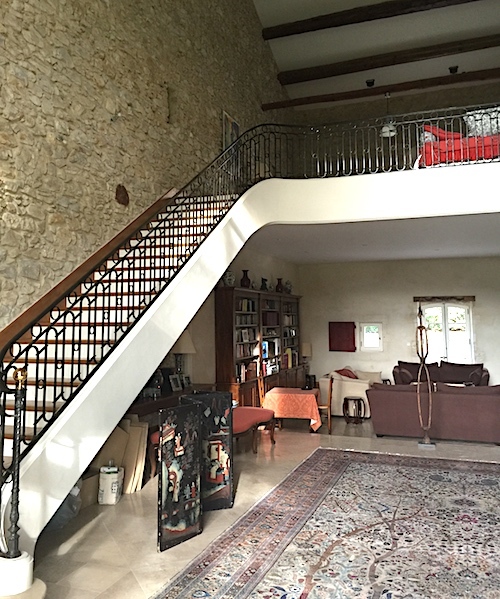 The classic style Provençal iron railing was built and welded on site. Job site visits were always fun! 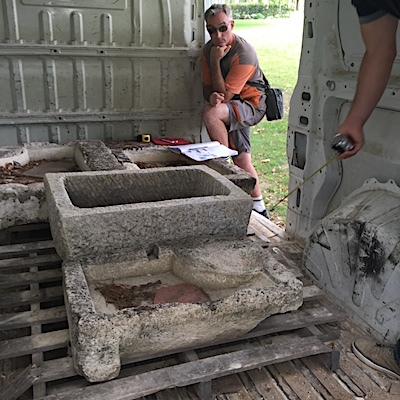 One time a truck pulled up with a variety of antique stone sinks for us to choose from for the Powder Bath. Doors after: stained and installed with a gingham check sheer behind the old glass. 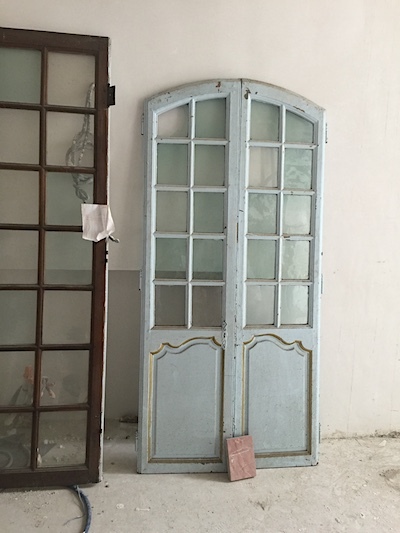 Lafourcade’s team would have antique doors and cabinets delivered to the site for us to choose from for built-ins. For example, the Formal Powder Room and the Mudroom slatted cabinets are old doors we chose and they fitted to the space. 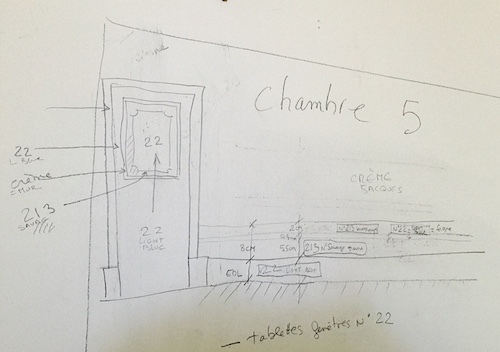 Painting plans for Chambre 5 showing specific color details for each wall. The house painting process was unlike that in the US. We used many Farrow & Ball paint colors, and also had colors mixed on site. The local painter Jacques would hand mix the colors and match and refine the shades. The Master Bedroom wall color in the Mas for example is what we call – “Jacques Crème”! Because technical details can often get lost in translation, for the complex painted line details that I proposed for the bedrooms, we would sketch and label each room’s painting scheme together at our site meetings to ensure Jacques had a clear plan of action. 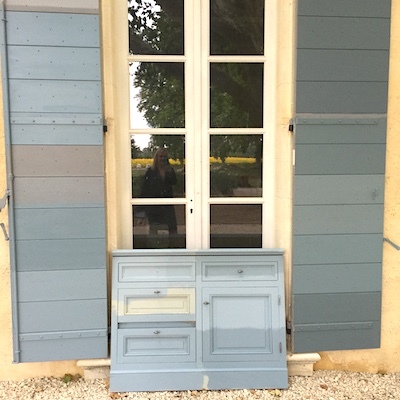 The exact blue color of the exterior shutter was a hard one to pick! I truly enjoyed the process of working closely with my longtime client and the Lafourcade team and their craftsman during this restoration to renew and refine the interiors. It’s always exciting to do interior design projects in another country, work with the materials indigenous to the area and learn about the traditional structural details. For example, I quickly learned about the door and window hardware, millwork details, classic terracotta flooring and exterior façade and shutter colors. It was exciting to collaborate on the design of the bathrooms and interior cabinetry. 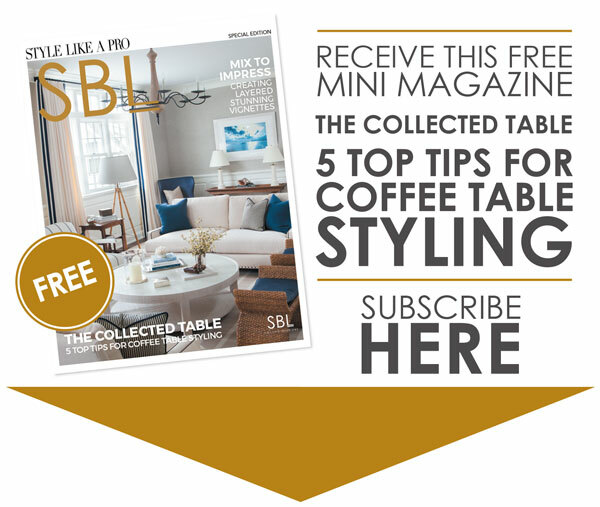 My client and I used Pinterest extensively to share ideas on French Country style. Also, I referenced often one of my favorite books, Compendium Architectural Antiques to propose paint colors, millwork details, and bathroom designs. 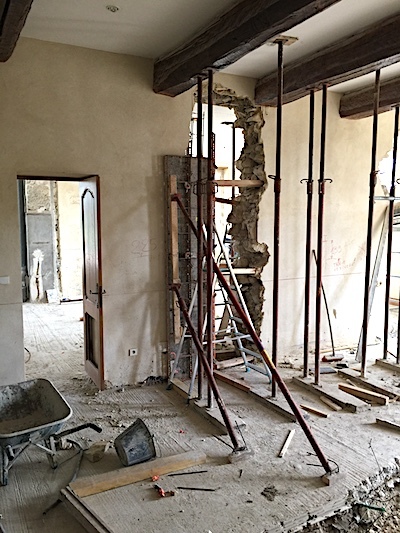 Check out the design development of the gourmet kitchen at Le Mas des Poiriers in our blog post Design Solutions: Le Mas des Poiriers Kitchen and the completed interior design on our website HERE.